FRANKFORT, Ky. (Sept. 13, 2018) — September is National Preparedness Month and thanks to a Rochester, NY-based law enforcement safety group, Kentucky State Police troopers and officers will now be equipped with a simple, proven device designed to help save lives. 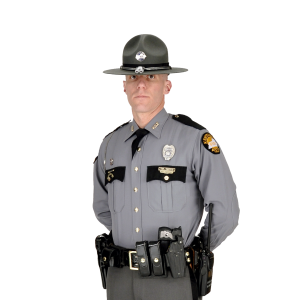 The Spirit of Blue Foundation’s “Trooper Cameron Ponder Memorial” grant provides $83,970 to the Kentucky State Police Foundation (KSPF) for the purchase of tourniquets and duty-belt cases for all of the agency’s troopers and officers. The grant is named after KSP Trooper Cameron Ponder, who was killed in the line of duty on Sept. 13, 2015. Tourniquets are vital pieces of medical equipment that law enforcement officers can use in the event of a traumatic injury to an extremity. When only precious minutes exist to treat such an injury, tourniquets are able to be applied individually or on a fellow officer to prevent excessive blood loss until that individual can be placed into medical care. As a secondary benefit, officers who carry a tourniquet are also able to use it to treat a member of the community who may have experienced a similar type of injury. In addition to KSPF, which applied for and will administer the grant, KSP Sgt. Clint Collins and Brenda Tiffany, the mother of fallen KSP Trooper Cameron Ponder, were instrumental in obtaining the funding. Eleven 10®, a Westlake, Ohio–based manufacturer of self-aid gear for law enforcement officers, and North American Rescue, a Greer, S.C.-based company, also partnered with the Spirit of Blue Foundation to create the tourniquet/duty belt case package. The Spirit of Blue Foundation is a 501(c)(3) organization based out of Rochester, NY. It is dedicated to the enhancement of officer safety and vitality throughout the law enforcement community by promoting public awareness for their protection and fulfilling safety equipment and training needs. The Spirit of Blue Foundation develops and executes fundraising campaigns nationally with the support of partner non-profits, national retailers and safety equipment manufacturers. Fundraising proceeds are distributed in the form of Safety Equipment and Training Grants to law enforcement agencies across the country from local to federal levels. Since 2011 the Foundation has awarded 87 grants in 35 states. 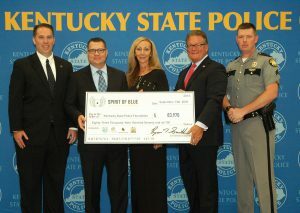 Photo caption: (left to right) Spirit of Blue Foundation Executive Director Ryan Smith and Bill Janson, president of Eleven 10, LLC presented a ceremonial check for tourniquets to Brenda Tiffany, mother of fallen Trooper Cameron Ponder, Kentucky State Police Commissioner Rick Sanders and Sgt. Josh Lawson, commander of the KSP Public Affairs Branch.